As a child I grew up in a house named The Orchard and although the land had long since been sold off several large apple trees remained which gave us a reasonable harvest each year. I have fond memories of the delicious fruit pies and crumbles my mother used to prepare. Growing fruit is one of the most efficient forms of gardening – once the trees are established you can expect an abundant supply for decades with only a little pruning and mulching to keep them happy. Bare-rooted trees need to be planted correctly and given careful treatment during the first year in order to establish healthy root systems and give a reliable harvest. Getting sufficient water and nutrients in the first few months after planting is essential and that’s why the timing is crucial. The number one priority is helping your new tree establish a healthy root system. The best time to plant bare-rooted trees is towards the end of winter or the first half of spring, once the ground is no longer frozen so it can be easily dug but before new growth starts. It’s worth consulting a tree nursery that knows your area and can advise on the window of time when they lift the young plants and deliver them and when conditions are right for your area. In the mild maritime climate where I live, trees can be planted from November onwards and this gives them a few extra weeks for the roots to establish but in harsher areas you’ll want to wait until spring. You will need to plant them quickly once they arrive – usually within a couple of days, though it’s possible to pack the roots with moist earth to extend this period if conditions outside aren’t favourable. If you miss the ideal window of time for your area but still want to plant this year, it’s worth paying more for container-grown plants. These will already have roots that have grown into the soil around them and as long as you don’t disturb these too much when planting, they’ll be ready to draw up moisture and nutrients during warmer weather. Sun or Partial Shade: Nearly all fruit trees require plenty of sun but by carefully scouring catalogues you’ll find there are some less well-know varieties that are tolerant of partial shade. Don’t just consider the ground – it’s the leaves that need sun and this often opens up possibilities for otherwise unproductive areas. Soil: Check our GrowGuides for which soil the fruit tree requires. Most will want free-draining soil, enriched with compost. Avoid areas that regularly flood or higher ground that dries out quickly. Wind and Snow: Be aware of the direction of prevailing wind and any large buildings nearby. A wall or fence may create a sheltered environment perfect for heat-loving fruits, or it could funnel icy winds during winter. Roofs can dump a ton of snow on an unsuspecting tree below, snapping its branches. Observe your garden closely to choose the best spot. Other Plants: Trees are remarkably good at drawing up nutrients and water from the surrounding area. Unless you’re using raised beds, remember that a nearby fruit tree or bush may compete with your other plants. Many good fruit-tree suppliers will sell reasonably priced kits that include a stake, tie, mulch mat etc and I think it’s a false economy to skip these items. Dig a hole about a spade’s depth and around 3ft (1m) wide. A square hole is better than a round one as it encourages the roots to push out into the surrounding ground. Keep the soil you have removed in a wheelbarrow or on a large plastic sheet. Add a few inches of good garden compost and work it into the base of the hole using a garden fork. Mixing is important so that the tree’s roots don’t meet a sudden boundary between compost and regular soil. Also mix some compost into the soil you removed. Look for the slightly darker ‘watermark’ on the tree’s trunk that indicates where the soil level was when it was first grown. Place the bare-rooted tree in the centre of the hole and a cane across the hole so you can check that this line is level with the soil around your hole as trees shouldn’t be planted deeper or shallower than they were first grown. If necessary, add or remove soil to achieve this. Most fruit trees will be grafted onto a rootstock and the join should always be above ground. Remove the tree and put in a thick wooden stake a couple of inches from the centre of the hole and on the side where the prevailing wind comes from. Hammer this firmly into the ground using a mallet. 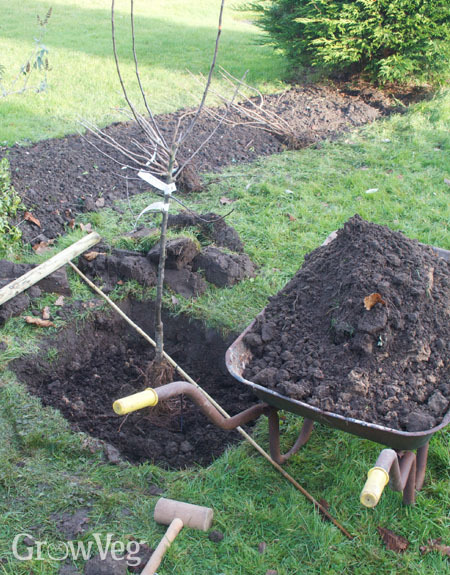 Place the tree back in the hole close to the stake and start to shovel the soil-and-compost mix back around the roots. Gently firm this in with your boots, being careful not to damage the roots. When it’s half full, pull the tree up an inch and then let it drop again as this helps the soil to fill in around the roots. Once all the soil has been added and firmed, fix the tree to the stake with the tie, leaving enough room for the tree trunk to grow but not so much that it wobbles about. Also add a protective tube around the trunk if animals are a problem. At this stage I also sprinkle a little seaweed meal fertiliser around and cover it with a bio-degradable hemp mat to suppress weeds. Water the soil well to stop the roots drying out and to further settle the soil around them. Until the root system is at least as large as the tree it supports, the tree is particularly vulnerable to environmental stress. During the first year, the tree can easily die from not getting enough water or nutrients. Keep the tree well watered, especially during dry weather. A good soaking once or twice a week is much better than surface watering daily, though during very hot weather it can be worth doing both. It’s also vital to keep the area around the tree completely free of weeds and grass as they will compete with the young tree, which is why mulch mats are very effective. Finally, don’t forget to remove all blossom from the tree in the first year. Although it’s tempting to let some fruit develop, doing so will again place more stress on the tree as it establishes and forgoing the first year’s fruit will result in a much healthier tree and better harvest in years to come. "what sort of apple tree would do well in sandy soil "
"I've grown a number of different apple tree varieties in sandy soil. In theory they prefer a richer soil but as long as you dig in plenty of organic material such as compost and make sure they are very well watered in dry weather (especially during the first two years) then I've found that most do well. Varieties that I have had success with include Discovery, Fiesta and James Grieve but I think most varieties will thrive if given the attention described above." "Hello, We have limited room for an apple tree and was wondering about a 'step-over' planted along allotment beds, instead. We garden in the north west of England on a sunny site with good soil, not too sheltered though. Would a step-over work for us? Regards Rachel and Elizabeth"
"Rachel - a 'step-over' tree would work in that situation but I'm not sure it's the best solution. The important thing to remember is that although the tree is trained along the edges of the bed, the roots aren't trained and will reach right under your allotment beds. The result is that once the apple trees become established, they'll compete with your vegetables for moisture and nutrients. In my opinion it's best to leave vegetable beds to have just those plants. Then use the borders (a fence if you have one, or the border with the next plot) to plant a series of cordon trees which will maximise the yield along the partition. There are other configurations that could work for you too but generally it's a good idea to put apple trees in their own space or along a sunny border." "I have two columnar apple trees in pots. I live in the northeast US and we just had 60 F weather. I checked in on my trees and they are starting to sprout. The temperatures have dropped again and we will have a stretch of below freezing temperatures. Should I be worried about the trees? If so what can I do? I have room in my greenhouse - are there any other options other than moving them?" "Joy - you should be worried if the trees start to produce flower buds because a hard frost will then damage those and you'll get no fruit this year. Watch them carefully to see if they return to dormancy or if the buds are starting to appear. If there are buds coming then you'll need to move them into the greenhouse and perhaps also cover them (old blankets or sacking can be used at night) during colder weather." "Although much of your information here is good, I'm a little surprised that you show a fruit tree planted in a lawn! That is never a good idea as it promotes shallow rooting because lawns have completely different watering requirements then fruit trees. Placement in the lawn can open the trunk up to damage from trimmers and mowers and disease. Also any chemicals and pesticides people may apply to the lawn will be taken up by the tree and transfered to the fruit. I usually recommend two stakes, placed on either side of planting hole - not next to the trunk - with one placed on the side of the prevailing breeze, as you recommend, and the other directly across. I tye the young tree loosely with two rubber ties looped in a figure 8 in such a manner that the tree stands on it own and only depends upon the stake for support in bad weather. To have the stake right next to the trunk, supporting the tree all the time, will result in a weakened tree, just as you would have weak legs if you had depended upon crutches to walk since a child instead of walking on your own. Finally I recommend a wide, deep well built around the tree just past the drip line and maintaining a deep layer of organic compost as a mulch, not a mat. Not only does this feed the soil and encourage worms, it reduces weeds, keeps the soil cool and reduces moisture loss through evaporation. It also allows you to fully ripen fruit on the tree. The deep mulch acts like a soft cushion for any ripe fruit that falls. Windfalls are not a problem when the soft mulch protects the fruit from damage, but check and collect ripe fruit daily during season. This is especially good for apples that do not come into full sweetness and maximum nutritional value until the last few days of ripening." "Hello, my question is about a very mature apple tree. I'm sure it was planted when this house was new in the late 60's, and I know fruit trees don't live/produce forever, but is there hope to get a few good harvests from it or just give up and let it be a shade tree? From what I have read it is a tree that is on a biennial cycle, loses almost everything it has in the 'June Drop', and anything left is wormy and squirrel eaten. I don't know what kind it is but the few apples that have matured have gone from green to half red.I have read about how to fix most of this, but is it worth it? Will feeding it more than we do help it to keep more fruit after the drop? I don't know how long it's been since being properly cared for, this is a new house. I would like to restore it to as much of its health as possible. Thanks." "Hi Tammy, Don't give up on it we rescued one far older than that which was in a terrible condition when we bought our house 10 years ago and now it is thriving. Regular pruning works wonders and letting air circulate through the tree helps. Take out any cross rubbing branches and any dead wood and any long whippy growth and tree to prune it into an open goblet shape. Re the June drop if you are selective and take off about one third of the fruit you find they cope well. It generally seems that thinning the fruit takes the edge off the biennial bearing too as that only occurs when the tree over produces. It sounds like a Bramleys Seedling which when allowed to ripen fully are often green and red. Susie." "Thank you Susie! I have only pruned what's dead and in the way of the house and head clearance and that's mostly it. I know it needs more but the shape of the tree makes it hard for me to decide what to cut since it is actually fairly open and goblet shaped. I will have a pro come and prune it because I feel bad when I do it even though I know it's what's best for it, haha. I will definately try taking off 1/3 of the fruit this year. The fruit does look like Bramleys Seedling also! Thank you so much :) Tammy"
"I was wondering what is the correct way to prune a bare root fruit tree, and if it is helpful to the tree?" "Sorry, I meant the ROOTS of a bare root fruit tree! Thank you "
"Mary - it's not usual to prune the roots before planting. If required, this will usually have been done before they are sent out. You need as much good root as possible on the plant as that's what is required to help the plant establish in the first year." "I have a selection of fruit trees of a variety of fruits and species at home. They are approx 2-3 years old now and have yet to fruit. I wasn't particularly alarmed as the past seasons seem to have had unfavourable spring weather in the UK not conducive to fruiting. I have been concerned this year however that the time period of blossom the trees seems to be fairly short lived. Compared with neighbours my trees seem to blossom much earlier, starting in mid to late march and gone within 3-4 weeks this obviously won't help with fruiting. Does this seem abnormal or can I do anything to change this?" "David: 3-4 weeks of blossom would be quite normal for a fruit tree. The main concern is where it happens early before a frost, which can kill the tender buds and prevent fruit from forming. If a frost is forecast it's often worth covering the trees with horticultural fleece at night (or an old sack or blanket) to protect them during this very early stage. Other than that, if you haven't had frosts since then all should be well." 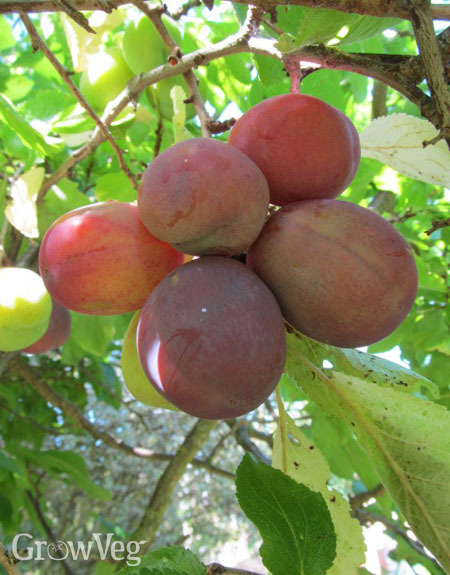 "I transplanted a few young fruit trees in late March to a very wet sandy soil area as I thought the moisture would benefit them all in our hot summer climate (I live in Central Portugal). Initially they all seemed to appear happy in their locations but over the last month the plum and two apples trees are looking very sad (slightly curled and droopy leaves and some dead leaves). I'm guessing the locations are perhaps too wet for them (they are all have good sun exposure) and was wondering if I should move them given it's late Spring now and we're currently getting temperatures around the mid twenties. Many thanks Roxy "
"Roxy - I wouldn't move them at all, particularly not at this stage, since moving them is likely to kill them. Usually the problem would be not enough moisture and sandy soil should provide plenty of drainage - were the roots damaged perhaps so that they can't access the moisture? Dig a little into the surrounding soil and see if it's actually wet further down. Add some mulch too. Hopefully they'll recover." "Great, thanks for your advice. I'm so glad I asked! I was just about to dig them up in desperation. I'm fairly confident the roots didn't get damaged but I guess it's a possibility. I'll check the surrounding soil like you said but I'm pretty sure it will be wet as the whole area is very wet as it's 1 metre below a swale (water channel). I perhaps should have mentioned that there is thick grass and weeds all around the trees, with about a foot of exposed soil surrounding them. Is it possible that the grass/weed roots are choking the tree roots? Thanks again. " "Roxy - Being below the water channel could be a problem. Any waterlogged roots will rot and that could have happened a month ago after planting. If so, there's probably nothing you can now do to revive them - it just depends how well he sand drained the water away. Again, I would dig a hole nearby and see whether the ground is waterlogged or not. It's always best to keep the area around young trees completely weed and grass free - at least a foot in all directions - because they compete with the trees for moisture and nutrients. Good luck with your investigations Roxy - Being below the water channel could be a problem. Any waterlogged roots will rot and that could have happened a month ago after planting. If so, there's probably nothing you can now do to revive them - it just depends how well he sand drained the water away. Again, I would dig a hole nearby and see whether the ground is waterlogged or not. It's always best to keep the area around young trees completely weed and grass free - at least a foot in all directions - because they compete with the trees for moisture and nutrients. Good luck with your investigations and don't give up - plant some trees elsewhere next year or in deep raised beds if the soil underneath is waterloggeed." "I think you're right that the main issue is probably the swale which is making the area very wet. I will check for waterlogged soil nearby and if so will redirect the swale away from the young trees. If I've caught it early enough maybe I can save them. Fingers crossed! Thanks again for your advice and speedy responses. Take care, Roxy"
"Help... I was recently seduced into purchasing on special offer, a compact fruit tree lot from gardeningexpress; 2 apple, pear,cherry and plum. They arrived a few days ago as bare roots and now I've investigated how and when to plant them, I am worried that it is completely the wrong time However I have no choice but to plant them up immediately. I am a little cross that the gardening nursery was selling them at this time in full knowledge that the chances of success were limited. What shall I do ... I live in Sussex." "Chantelle - I agree they shouldn't be selling them. However the best thing you can do now is to get them into the ground and then keep the ground consistently moist (but not waterlogged) and weed free during the summer and keep your fingers crossed! Remove any flowers to stop fruiting this year and perhaps next. If the summer is not too dry they may do fine. Good luck." "How soon should I expect leaves after planting a bear root peach tree?" "I bought 4mixed bare root fruit trees 5weeks ago and are in big tubs there is no sign of shoots do u think they are dead or is there hope"
"I have three dead fruit trees in a new garden and wish to replant. I have no idea what they were or what they died of. Can I plant in the same spaces that these trees grew in when I take them out? There is a pear, cherry, fig and two plum trees growing happily in the same part of the garden. Please advise? Katy"
"I think that if by the end of the season there are no signs of growth (ie shoots or leaves), then it should be possible to replant. Just follow the directions above and make sure the area is free draining and enriched with compost. Above all, don't replant until trees are dormant - late autumn to early spring. " "about 4 years ago I ordered a dwarf cherry (bare root). It seemed to do well and has finally begun to produce fruit. However the cherries are very small and taste extremely bitter; not at all like the sweet-tart, "perfect for pies" cherries I ordered. Could I have gotten the wrong tree? or could there be some other explanation. Maybe it was my fault for ordering from one of those big catalogs I get in the mail." "This link is very informative. Thank you for being there for us." "I have rescue crabapple tree in my front yard. I bought it from the green house - it was potted. I followed the directions in planting and it seems to have done well except I am a little worried about it. It seems the roots are not established. I have noticed that the root ball is rocking in the hole. I know I shouldn't pack more dirt on top of the root ball so I am waiting for it to establish but in the mean time I have it staked so a strong wind doesn't take it down. I planted it 3 summer's ago - the following year it blossomed like crazy and I did not know I should not allow the fruit to grow. It had a nice little crop of apples and then this year not one blossom appeared. But, it seems to have done well this year - looks healthy and all but still doesn't seem established. Should I do anything else for it - or just wait?" "I realise that you perhaps should not but if any of my trees were rocking slightly I would give them a good sprinkle of compost and some water to try to secure the trunk a little more, that way it gives the roots more chance of establishing as they are not being rocked around by the wind which even if they are staked can happen. Crab apples are pretty hardy really though and you have to work at harming one, yours sounds fine, sometimes it does take them a while to establish I have a James Grieve that after 5 years still looks a bit wobbly. I wouldn't worry about the lack of blossom either, it sounds like it is putting the energy into keeping healthy and growing. At this time of the year I mulch round the base of all my fruit trees with a nice pile of homemade compost, not touching the trunk but a few inches away and then round in a circle. Their treat for a job well done and an investment in next years crop." "This has been very helpful"
"Hi there, I have recently bought a house with a James Greive apple tree in the garden. It is in full bud right now, but we are about to have work done on the house (extension added) and the tree is right on the edge of where the extension will end. I would preferably like to keep the tree and just move it, but from reading the comments above the tree should only be moved at the end of it's season. This is not possible, will it kill the tree to move it now, or I risk it being damaged by machinery if I leave it?" "Emma, it's not advisable to move it now and the question is also how old is the tree - if it's many years old then I think it's probably best to just plant a new tree in the other location. If you do move it, I suggest removing all buds to help reduce the stress and keeping it well watered both before and after the move." "I need help, I've been bought a tiny crab apple tree that was in a small plastic pot with some earth in. It's winter and I've planted it in a large pot in the garden with compost. Should I have done anything different? Maybe planted it in the ground? Or not at all until spring? Would that have killed it though? " "Hi - I see this is primarily regarding apple trees. My new trees are Purpleleaf Sand Cherries. I planted these here in NJ last autumn (2014) as per the directions. It is now April 2015. I have yet to see any type of growth. There are really small bud looking nodes, but the trees seems basically the same as they did when I planted them. We had a really hard winter this year. When should I expect to see actual growth from these trees?" "Thank you, the first sensible, not overly wordy article on gardening. I got the information I needed." "I have a peach sapling that I planted last fall. It's very young and only about 2 feet tall. It started to grow leaves in the early spring, but then it got colder for a spell and the leaves browned before they unfurled, and died. I did fertilize it and I continue to water it 2x per week. Should I be worried that it will not survive if it does not leaf out or bloom at all this summer? Also, I have a columnar apple tree that bloomed but didn't bear fruit last year and this year it leafed out with no blossoms, even with frequent watering and some fertilizing. Any recommendations? Thank you." "Hi, After a cold snap the new leaves could have become frosted and may well come back but later on in the summer. A good way to check wether your tree is still alive is to scrape a small piece of bark and see if it is still green. What I do with mine is actually a small prune and if the wood is still green then I know I am ok. If it shows brown then I continue to prune back until I hit green wood and then water it once a week and wait. Re your apple tree, they take a few years in general to become established and to bear fruit even if you have had blossom. I had my first apple off one of mine last year ( 4 years) after it had been planted. What I have found makes a big difference is that in the fall I add a large amount of compost (homemade) around the roots and just leave it as a mulch to rot down over the winter. This seems to give them a kick start for the next year and protects the roots from frost too. Hope this is helpful. I did find this article (not suggesting your trees are dead by any means !) But it did cover a good check list of why some do not 'Take" and thought it might be useful to use as a check list for the peach (just in case). Hope all goes well with them both https://www.rhs.org.uk/advice/profile?PID=809"
"Thank you so much, Susie. Very helpful!" "Additional question, Susie: Would you suggest watering only 1x per week for the peach sapling, instead of 2? I water my larger apples 2x, so have been doing the same with the peach. I do a soak. How long would you recommend for a watering period? Thank you." "Hi, Thanks for getting back to me and glad that you found the info useful. I think that unless you live in a very warm area a really good 10 minute soak once a week should be ok. I have to say I do soak my fruit trees for longer than that but they are mature and that is when the fruit needs to swell. It is always hard to find a good medium with a young tree, too much and if it is weakened it could lead to rot and too little then it will wilt. I think that since it is so young once a week though should be alright.Susie"
"Hi, we have ordered two bare root apple trees for delivery in November,, our question is how far in advance e should we prepare their new homes. Is it too early to dig the holes now, or is this a good time. Should we add ma ure as well as normal compost and soil and water well and keep moist until they arrive . Naturally we are keen to give them the best possible start. Your advice appreciated"
"How and when I can transfer my fruit trees from a pot into the ground. They are not doing well in the pots on the decking." "Mrs Healing - it's fine to dig the holes in advance. I'd recommend compost mixed in rather than manure but it's up to you. The main thing is to follow the advice in this article carefully during and after planting." "Joyce - you can transfer them whenever temperatures are cooling. Young trees will transfer better than older ones - it all depends on whether they have become 'pot-bound'. Good soil preparation and making sure the ground is moist but not waterlogged will help. There are no guarantees with older pot-raised trees and sometimes it's better just to replace with new stock, so you'll need to monitor them and see how they do once transferred." "Great video..I have been an avid gardener for years but lost 2 plum trees,,,,apples o.k. Your video is straight- forward and easy to understand. Would recommend." "i have a peach tree i planted almost two years ago but it started to flower and i noticed some spiders and decided to spray it with sulfur but the flowers fell off and now it looks like its drying. Can i still save my tree?"